The Bokeh frame sets and bikes took over a year to develop and perfect, they are AdventureSport machines for fast 'Continent Crushing', Multi-Terrain rides and they can use either 650b x 50mm or 700c x 45mm tyres. AdventureSport is about doing it fast. That's what our original Mason bikes do well, and that is what we're continuing here with Bokeh. The unique brief: A thoroughly modern, Italian craftred, Columbus steel, Multi-Surface, performance bike that excels across all seasons and many disciplines. The latest Thru-Axle/Flat-Mount refinement, adaptable internal routing, electronic shifting options and clearance for large volume tyres and mudguards. The buttery smooth ride of steel but with a stiff kick when you accelerate. It’s all here. Our multi award winning, Italian crafted, custom tubed, premium Dedacciai Aluminium framed bike with many of the advanced features of modern carbon bikes, but offering way more. Disc brakes, adaptable internal routing, electronic shifting and 1x gearing options and clearance for larger tyres and mudguards mean our bikes are perfect for getting your head down and knocking off the miles in all seasons and across all surfaces. We've had a few 'Best Of Test' results but I'm pretty sure this Cycling Weekly test result for the new Mason InSearchOf is our first ever 10/10! VERY pleased to receive this ultimate test result for our new Ultimate Adventure machine. "...The astonishing thing about the ISO is just what you can tackle when riding it. So wet, muddy or compacted chalk uphills which would have defeated me on just about anything else I could just roll up on the Mason ISO. Likewise, you float through deep sand and all but the deepest, sloppiest mud holes." Click the button below to read the full Cycling Weekly test. Fiets Magazine were the first in the world to run a grouptest featuring our new Mason InSearchOf and it was up against some hard hitters - Ventus GRD, J.Guillem Atalaya, Bombtrack The Hook ADV. "Testing works out great. We did a big loop yesterday on de ISO here in Finale. Including some real rocky mtb decents. The ISO is made for much more than 'normal' gravel and fast stretches of strade bianche looking roads. It's an adventurebike made to do whatever you want. Fun mtb sections, long bikepack days and gravel rides with a bit more bite. I love it." Take a look at full grouptest highlights in the link to our blog below. An update from Daria and Thomas, they've just returned from a successful adventure in Oman, following some of the trails taken by Bikingman Oman earlier this year. "It was an unforgettable adventure for us. We also think that having such a great bike motivates to go out, to do something outstanding, therefore we’re already planning with excitement our next cycling journey!!!" "Proving that life can exist without carbon, the Mason Resolution 2 showcases all that a modern steel bike can offer, with an excellent ride that just keeps you coming back for more...So it’s collected one of our coveted Editor’s Choice 2018 awards for the best rides we’ve had in 2018." The final question I have is one that I've been itching to find an answer for since we lined up this interview what does the future hold for Mason Cycles? The Mason Resolution 2 adds new features to what was already an excellent bike. The ride quality just makes you want to keep riding and it’s got all the bolts and add-ons so that you could take on ultra-endurance and bike packing trips as well as just enjoying local rides, whatever the season. We've hand-picked the best available components from two class-leading designers to piece together the ultimate dynamo + lighting set-up for all-terrain and multi-surface adventures. Spec'd with the best available lights and hubs from class-leaders Supernova and dynamo specialist SON, CNC machined and manufactured in Germany. "...the Definition rides as nicely as it looks. It's one of the few bikes that has most of our test team really smitten. The acceleration and power transfer that you can generate through the Definition is almost otherworldly..."
We're very happy to feature in a strong line-up of British-designed bikes, thanks for the words Road.cc!. Another fantastic result for our Definition model. Jack Sexty thoroughly reviewed our Definition2 Ultegra Hydro for ~2 months in all conditions, making for a comprehensive and realistic opinion on our premium Alu. road-machine. Road.cc | Reader Awards | Winner! We are incredibly happy to win the BIKE OF THE YEAR for our Bokeh AdventureSport bike in the 2017-18 road.cc 'Readers Choice Awards'. We pride ourselves on high levels of customer service and a personal approach and for these reasons this award means way more to us than any of the other awards or test wins since we started in 2014, because we were nominated and voted for by YOU. A HUGE thanks from all at Mason Cycles. Road.cc | Six of the best Alu. road bikes. 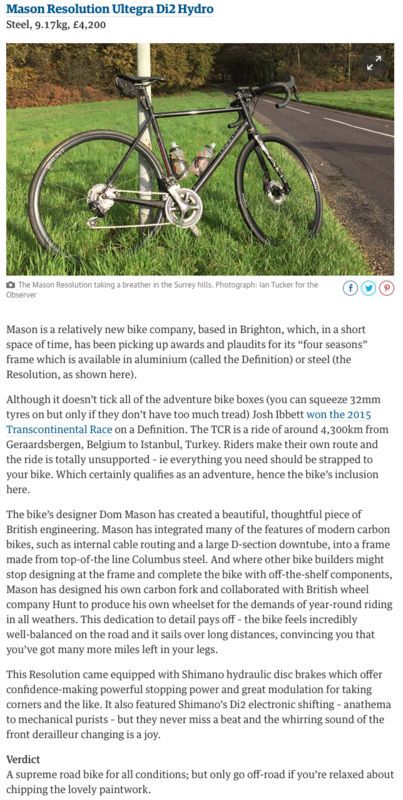 "...If you want an aluminium bike with space for wide tyres and mudguards, then look no further than the beautiful MASON Definition. That's it. List done..."
Another list-topping feature for the range-topping Definition2 RED eTap. "...Mason focuses on meticulously-designed aluminium and steel bikes, including this version of his Definition all-rounder. Mason says: "for our multi-surface/all-season bikes, lightness is not important without a high level of durability and dependability … this is where wireless, electronic systems really win." ADVNTR is a new website devoted to adventure cycling "Our goal is to connect the Adventure Cycle community and bring you information and resources to improve your experience". We really like their style and approach and oh, two of them choose to ride the Mason Bokeh! The guys from ADVNTR.cc recently visited the Mason Barn and spoke to Dom about the beginnings and future of Mason Cycles, they may have even grabbed a scoop or two! Click the button below for the full article. We have demo models of all bicycles in various sizes at the Mason Barn and it's well worth visiting to ride one on the country lanes or riverside gravel loop, straight from our doorstep! Customers have come from all over Europe to take a bike out for a spin and it’s well worth the trip to put your mind at rest over sizing or which Mason model is exactly right for your riding requirements. We are expanding the demo range as we grow and add new models and options so please contact us to see what is available. For more information on Mason Cycles, our bicycle and frameset range and to enquire about a demo, click the button below. A solid history of Cycling Plus Magazine 'Best On Test' Winners for our Resolution, Bokeh and Definition bikes. "Dom Mason is the savant behind a decade of classic bikes released under another brand, but now he produces sublime riding and stunning detailed Italian-made frames and bikes with his own name on." Everything you need to get thoroughly and splendidly lost." The SRAM Rival 1X is a new option but the sequential shift and 160mm discs suit its purposeful character brilliantly." The best recommendations come from our customers and it's even better when they write a great review too.
" The Bokeh slips in at the sublime end of the spectrum. If this bike is on your wish list then don’t hesitate. I doubt you will regret it. If you can accept what this bike is, and what it is for, then you are in for a real treat.". Our Bokeh Rival1X grabs the top spot and BEST OF TEST in Bikes Etc Magazine November issue, up against very capable bikes from Specialized Bicycles and Kinesis UK . "Supreme on and off-road ability...it's easy to see where the extra money goes. The whole bike has been extremely well thought out and is sensational to ride". CYCLING WEEKLY: 9/10 BOKEH REVIEW. "Dom Mason has really sweated the details with the Bokeh, resulting in a supremely versatile, do-anything machine, well suited to the trend for pointing your drop-bar bike off road too." "You’re getting a beautifully finished, Italian-made custom frameset from a low-volume producer. And Mason has really thought about what’s needed for a versatile on/off-road machine." CYCLING WEEKLY | JULY 2017. 1 day, 16 hours in and Josh Ibbett is still leading the Italy Divide race by about 50km as he reaches Bologna. His Bokeh 650b SRAM Force 1x with Panaracer Comet 50mm tyres is the ideal machine for this unsupported 900km race, starting at the Colosseum in Rome and finishing at the tip of Lake Garda. ROAD CYCLING UK: 'Starting From Scratch'. RCUK takes a look at the men behind three start-up British bike brands, including Dom Mason the designer and owner of Mason Cycles, on innovation, forging an identity and realising a dream. "The excellent reviews garnered by Mason Cycles proves that his decision to follow his instinct has been the right one. Mason is a man with his finger on the pulse of British riders." BikeBiz Awards: 'Bike Brand of The Year' finalist. Fantastic news that we have again made it to the finals in a very strong lineup for 'Bike Brand of the Year' in the BikeBiz Awards this year. Thanks for your nominations which put us in the finals and we'll keep you updated to how we get on! AlwaysRiding: The (not so) Winter Hack Bike. Tracing the evolution of the 'winter hack bike' leads to the door of Dominic Mason, founder of Mason Cycles and early Kinesis designer. Here Dominic recounts his early days designing what would become the new standard for off-season steel:. "I think I had a little hand in changing the concept of the 'winter hack' when I designed the first 'Racelight T' bikes for Kinesis. At that point you were supposed to suffer on an awful, heavy, dull, steel hack through winter and sling all your shredded old components at it...So I did the Racelight Tk out of some decent tubing and people started putting Ultegra on it........I called them '4Season' bikes [up to then only used on sleeping bags] and they sold amazingly well. After that the all season bike became more and more popular and now I think my ultimate expression of that is the Columbus steel Mason Resolution"
WIRED MAGAZINE: Gear Of The Year. Wired UK magazine hits the Newsstands on Thurs: Our new Bokeh SRAM Force, 650b bike makes the cut. Dom from Mason Cycles talks about his new alloy and Ti Bokeh framesets, and more: Most of these features and decisions he makes are the ones that most won’t see or even bother about, but they’re the ones that make all the difference between normal and special, the little detail that you might spot once you’ve owned a Mason for a month or two and it gives you a little smile. “...It’s much much harder, but now I know the people that make the frames, I met them earlier and they gave me a hug, I get my hands dirty in their factory and we talk about things, and they try quite hard to get things right for me." road.cc: First painted Bokeh AdventureSport bikes unveiled! "so good do they look that we just had to share them with you...The wait looks to be worth it." Road.cc have been covering the development of Bokeh over the last year and they've now released the studio shots from the new Mason barn HQ! AdventureSport Product details and Pre Order info. We are 'Mason Progressive Cycles’ so we have developed the V2 version of our award winning Aperture fork. The V2 Aperture is completely new tooling and features Ø12mm Thru-axle, flat-mount, a little more tyre clearance as bigger tyres are becoming very popular, sealed internal routing, and of course all the mudguard mounts and fittings of the V1. The fork also features our unique Mason 'F-Stop' axle system, with Mason developed axle and replaceable fork inserts. We've just finished ride testing the new fork and it really is excellent, it'll certainly be worth the wait. The whole package is pretty advanced. “…to us, ‘AdventureSport’ is when you’re out there underneath a mountain, riding fast. We’re not talking about gravel. The word ‘gravel’ sounds dull to me. AdventureSport is about doing it fast. That’s what our original Mason bikes do well, and that’s what we’re continuing here with BOKEH”. Dom Mason | Mason Cycles owner/designer. The new ‘Bokeh’ [Alu] and ‘BokehTi’ frame sets and bikes have been in development for over a year, they are AdventureSport bikes for fast ‘Continent Crushing’ rides and they can use either 650b x 50mm or 700c x 41mm tyres. These new bikes are big news for us because they are the bikes to follow up our first ever models the Award Winning Definition and Resolution. The first painted Bokeh frames are here, they will be available in Element Grey [see pic.] and Flare Orange. We aim to have Bokeh and BokehTi framesets and bikes available on the site by the end of September. Pre-orders for the first small batch are available now. Please contact us below for more information and to secure your Bokeh or Bokeh Ti. PRODUCT UPDATE: CAMPAGNOLO BB SLEEVES IN STOCK. Can you build your Italian-made framesets with Italian transmission? You can now!! We've secured stock of original Campagnolo BB sleeves. This means that you can build your Definition/Resolution with all 24mm Campagnolo disc groupsets. These will be available for sale on our webshop very soon. Without doubt, the most valuable information for us is the feedback that we get from the very customers who ride our bikes and make up the growing community. We've been trying our best to make this as visible as possible through our 'MASONbuilt' gallery and 'MASONcite' blog posts, but for us this wasn't enough. So, we now have AN ENTIRE SECTION of our website developed to clearly display the MASONbuilt/cite archives. This will be kept fully up to date with your latest comments. This new section also includes access to the full archive of press literature & awards that the Resolution and Definition bikes have accumulated. THANK YOU! to everyone for your comments, reviews, and for staying in touch. As comfortable as it is just cruising along, you end up attacking climbs and sprinting for signs just because it's so much fun. I'm not altogether sure what I expected, but what I got was one of the most enjoyable bikes I've ever ridden. Looking forward to our new products prompted me to take a look back to where we started. Nicely explained in this short vid. CYCLING WEEKLY: 9/10 RESOLUTION REVIEW. CYCLING WEEKLY | MARCH 2016. MASONcite: THE RIGHT BIKE FOR THE JOB.
" It's what I bought the bike for. There aren't many bikes out there that I would be as happy riding the gravel roads through the forests and along the rivers then heading out for some big climbs around the Verdon/Nice/Liguria. It's an amazing achievement to get so much into one bike. It felt like I was always on the right bike for the job whatever the job may be. Ed Robins | Definition 105/Hydro. The Guardian recently featured an 'Adventure Bike' article and we qualified for inclusion due to the ability of our bikes to take long distances and varied road surface and terrain in their stride. Oh and of course the ability to carry a rider to the winning spot in one of the most epic of cycling adventures, The Transcontinental Race. "Mason has integrated many of the features of modern carbon bikes, such as internal cable routing and a large D-section downtube, into a frame made from top-of-the line Columbus steel." Spring is here and we are celebrating by giving you 20% off every full kit order [as modelled here by TCR 2015 Winner Josh Ibbett] before 31st May, and FREE SHIPPING on all all items of clothing to UK destinations. Enter 'RideMason' at the checkout to get your discount. The latest and greatest news is that our next batch of forks are in Italy and being painted now and we hope to have them in the UK and available for your framesets and bike builds by the end of May. Our framesets and bikes are marked as 'Pre-order' at the moment, frame stock is good but we were a little behind with fork manufacture, we can now get back up to speed. We are very different from many small bike brands and one major difference is that we don't settle for 'off the shelf' components if they don't suit our ideals. Because of this we designed and tooled up for our very own fork, the Mason 'Aperture'. Our unique fork has allowed us to design bikes with superb award winning ride qualities and our success has meant that demand has outstripped fork supply and we have been playing catchup! Thanks to all of you who have pre-ordered, we will be emailing you all personally with details and will keep you updated. "The Resolution is dripping in clever design features. It has eyelets for mudguards and a rack but you wouldn’t see them at a glance as they’re hidden discreetly inside the stays"
"...Mason has pinned his colours to the mast by making both the Resolution and Definition disc-specific. It makes complete sense for a progressive, do-it-all, British-designed bike like this." "It is, quite simply, a beautiful frame – that rare combination of understated but captivating." We were hoping to feature in the road.cc awards this year but could not have dreamed that we would bag a rosette in not just one but THREE categories! 'Frameset of the Year' - #1 with our Resolution frameset. #4 with our Definition frameset. 'Sportive Bike of the Year' - #3 with our Resolution 105/Hydro bike. 'Bike of the Year' - #6 with the Resolution 105/Hydro. "This was a very strong category and picking a winner was no easy task." And so to the winner of the frameset of the year award, and it’s the Resolution, the steel frame version of Mason’s Definition earlier in this list. There’s little to match the sublime ride quality of a really good steel frame, and the Resolution is a really good steel frame. Why it wins: Classic steel ride quality with modern details including disc brakes and space for wide tyres. "A triumph in cycle manufacturing"
It would be a very special machine indeed that could persuade the cycling devotee to stop his endless quest for “just one more bike,” but when it comes to a Mason you might instead find yourself looking to get in just one more ride instead. A triumph in cycle manufacturing. Very honoured to be included in the Vulpine Christmas Wish List for 2015. London's Bespoke Cycling are the World's first MASONcustom store. This means that they'll be building up dream custom bikes around our framesets, and fitting you to them too. BikesETC: THE WORLD'S SEXIEST BIKES. The steel Resolution sits above some hot company at No.3 in the world's sexiest bikes. A huge amount of thought has gone into the Mason Resolution. Mudguard and pannier bosses (top and bottom of seatstay) are as neat as can be, leaving the Resolution’s lines resolutely ‘racy’. A chain-hanging tab is a blessed old-school touch to stop the chain dragging on the chainstays when the rear wheel is removed. You don’t want to scar paint this good." ROAD.CC: THE 15 BEST STEEL BIKES. "There’s nothing much traditional about this bike, with internal cable routing, disc brakes and space for 28mm tyres and mudguards." STOCK UPDATE: NEW FRAMES HERE SOON. Excellent recent reviews and strong demand as Autumn approaches has left us a little low on stock, but fear not, stock is on the way from Italy and you can secure a frame or bike with a pre-order. Click the button below for full details. BIKE RADAR: TOP RESOLUTION BIKE REVIEW. "Beautiful blend of buoyantly responsive ride, surefooted control and next level detailing…an utterly practical all-rounder you’ll still be begging to ride all weekend"
"...get the gear turning and you still get steel’s signature surge of speed like the turbo kicking in on a diesel car." CYCLING WEEKLY Aug. 20th: 9/10 Review for Mason Resolution. "Slick Stylish and addictively rideable"
"Mason has produced an on-trend endurance road bike with a quality feel, clever design and retro-appeal. Thanks to the disc brakes, internal cable routing, wide tyres and mudguard clearance, you could ride this bike through the worst a UK winter has to offer, making for a truly versatile machine." Transcontinental Race 2015: Josh Ibbett wins! Riding his race prepared Definition Ultegra Hydro/Di2 and covering an incredible 4239km at a moving average of 25.9kph in 9 Days / 23 Hours / 54 Minutes, Josh won the Transcontinental while the rest of the racers were in another country! WELL DONE JOSH! WE ARE IN AWE. We are extremely proud to say that Mason Cycles has been nominated for TWO awards in the prestigious BikeBiz awards for 2015. 'BREAKTHROUGH BRAND' and 'BIKE BRAND OF THE YEAR'. Cycling Plus: Steel Bikes Grouptest WINNER. In a recent Cycling Plus magazine group test, the Mason Resolution Ultegra/Hydro came out on top against some of the most established brands of the steel bike world. Full story on the site soon. "Beautiful blend of buoyantly responsive ride, sure footed control and next level detailing." "All weather confidence, all purpose utility and ultra detailed style." 4.5 stars. Mason Resolution, Ultegra Hydro. CYCLING PLUS. Aug 2015. Josh Ibett is currently lying in 2nd place during the gruelling Transcontinental Race in which competitors ride unsupported from Flanders to Istanbul. He has chosen a Mason Definition Ultegra Hydro/Di2 to carry him on his journey. "It’s a four-season bike that’s designed for long-distance riding so it’s actually perfect." "Owning a bike like this is a real experience rather than just something materialistic, the Resolution has a soul, it's more than just a form of transport or a tool for fitness it's something special." "A truly amazing piece of engineering from the initial frame building right the way through to the overall finish." "Production bike with bespoke feel and wonderful, inspiring, addictive ride"
"The attention to detail, the finish, the welding - there isn't a fault to be found anywhere on the frame or fork."